The Wikileaks cables, the Arab Spring revolutions, and the fall of the Libyan dictator are uncovering a wealth of new information about the complex relations between the US, some Islamist movements, and the Islamic and Arab regimes. This week, the president of rebels’ military council in Tripoli, Abd al-Hakim al-Khouildi Belhaj, revealed a small part of those decades-long relations when he demanded an apology from the CIA and MI6 and threatened to sue the US government for illegal detention, rendition, and torture. Like the rest of the Arab world, the rise of Islamist movements in Libya began in the 1970s. But the militant Islamists rise to prominence was partly due to a number of factors. First, the failure of the Arab nationalistic regimes to pull the peoples above poverty and social stagnation created a leadership vacuum. Second, the perceived timidity of the moderate Islamist groups such as the Muslim Brethren to realize political change through democratic means due to government violent crackdown. Third, the US-Saudi alliance against the Soviet Union provided political, military, and doctrinal support to transform these movements into battle-ready battalions. As the Mujahidin fighters in Afghanistan returned home, these groups added a military component to the struggle against the Arab regimes. US covert involvement in the training and arming of Afghan fighters is now a matter of public record. The Saudi role in financing and indoctrinating these fighters is now being unveiled thanks to the splits occurring within these Afghan groups. The examination of the intelligence records uncovered in Libya after the fall of Tripoli, the testimony of a number of Islamists, and the newly published books on the subject provide adequate data to reconstruct the hidden and public facets of US involvement in the Islamic world. In Libya, from the late 1970s until the 1980s, at least three major Islamist movements burst into the public scene: Al-`Ushbi movement (named after the founder, 1982), al-Jihad movement (founded by Iwad al-Zuwari, 1989), and al-Shuhada movement (founded by Mohamed al-Mahashhash, 1989). All these movements were crushed by the regime before they actually represented a security threat to Qadhafi. Only the groups that were active in the Afghan war were able to establish a viable leadership hierarchy. For example, the Libyan Fighting Group (LFG) managed to establish its own camps, its own media (al-fajr magazine), and its own indoctrination literature (i.e., Outlines of the Libyan Fighting Group) thanks in part to Saudi private and official support. When the Afghan war ended, some of the LFG members went to Sudan and Yemen, but the majority went to Algeria to support the Algerian-Afghans who took up arms against the regime after the cancellation of the 1991/92 parliamentarian elections. Within a couple of years, many of the Libyan fighters were assassinated by the Algerian GIA (Algeria’s Armed Islamic Group) because they were deemed deviant. Shunned by their hosts in Sudan, Yemen, and Algeria, the Libyan-Afghan fighters returned to Libya and in 1995, they re-established the LFG and set up camps in the Green Mountain in eastern Libya under the leadership of Abd al-Rahman Hattab. Soon after, the regime accused them of attempting to assassinate Qadhafi and they were pursued until Hattab was killed along with many of his lieutenants. Defeated, the remaining LFG fighters fled to Afghanistan again. There, many of them, including Abu Yahya al-Libi, Abu al-Layth al-Libi, and Abu al-Faraj al-Libi, joined al-Qaeda. The rest refused to join al-Qaeda because of ideological differences. Those who did not join al-Qaeda elected the young Abd al-Hakim Belhaj (then known as Abdullah al-Saddiq) as their leader. They remained in Afghanistan until 2001, when the US began its Afghanistan military campaign. The LFG, then, left Afghanistan and moved to different countries. In 2004, Belhaj was arrested in Malaysia and handed to US officials. He was subjected to extraordinary rendition procedures moving him from country to country, including Thailand, where he was tortured (as he claimed in recent interviews). Ultimately, the US authorities determined that he was not a member of al-Qaeda but nonetheless decided to hand him over to Qadhafi. Once in Libya, he and nearly 100 other LFG members were thrown in the infamous Abu Salim prison where they were allegedly subjected to torture, isolated confinement, and abuse. Many members of the LFG who were not either killed or imprisoned ended up in London. British authorities, then still at odds with Qadhafi over his involvement in the airplane bombings, thought that they could gain leverage by offering refuge to the rest of the LFG members who escaped. However, after Qadhafi agreed to hand over the bombing suspects and pay compensation for some of those cases, he relied on his son, Saif al-Islam, then pursuing an advanced degree in one of Britain’s universities, to enter into a dialogue with LFG members. The conversation in London did not produce any results. To advance a breakthrough, Saif al-Islam sought assistance from members of the moderate Islamist group, the Muslim Brethren in Libya. Specifically, he enlisted the counsel of Ali al-Sallabi to convince the LFG members to reconsider their ways and rethink their ideology. Al-Sallabi met Belhaj many times to discuss these topics, including the difference between the two groups’ approaches for social change. Belhaj then met with the LFG leaders who were incarcerated in the same prison and began a discussion of their political, religious, and social doctrines. Consequently, the group produced a revised blueprint and a restatement of their political and religious views. The document, entitled Dirasat tashihiyyah (corrective study), was published and Qadhafi ordered the release of Belhaj and 214 other LFG members in March 2010. Reacting to the publication of the book, the Salafi (Saudi-backed) groups issued harsh decrees accusing Belhaj of abandoning the way of ahl al-sunna wa-‘l-jama`a and calling him zindiq—the same pejorative label used by Qadhafi to describe his opponents. The Saudi intelligence agencies built a thick file about Belhaj and his followers, and outlined a new strategy to retain influence through the Salafi groups still active in Libya. Though Belhaj was born in Tripoli, he decided to resettle in Benghazi after his release from prison. When the February 17, 2011 rebellion started, he joined in along with a number of the LFG members. They formed one of the most disciplined brigades and led the charge for Tripoli. His brigade was the first to reach Bab al-Aziziyya, the fort from which Qadhafi had called Belhaj and his comrades “rats.” From there, Belhaj declared the battle for Tripoli - and Libya - over and promised to bring his former jailer to justice. These unlikely events brought about by the extraordinarily sudden revolts sweeping through the Arab world expose the complexity of the US-Islamic world relations. Documents discovered after the fall of Tripoli, many of which were given to human rights organizations, show that the US continued to offer Qadhafi’s regime advice about how to survive the revolt until days before his fall (until August 2; He fell on August 20). Other reports also show that Saudi security agencies were alarmed by the rise of the Muslim Brethren, as well as by lack of support for the Salafi groups on whom the Saudis depend for influence in the Islamic world. While the US is worried that Libyan rebels like Belhaj may seek redress for the torture he suffered, the Saudis are nervous that the emergence of representative governments will weaken the foundation of their authoritarian model. These events represent an eerie repeat of history. In the 1980s, the US, the UK, and Saudi Arabia participated in a joint project to train, arm, and indoctrinate fighters to defeat the Soviets and their allies in Afghanistan. Some of these fighters were behind the 9-11 attacks. Today, the same Western governments (albeit under the cover of NATO) along with key Arab states such as Qatar, Jordan, and Saudi Arabia, are involved in a new military adventure in Libya. The difference, this time, is that the Arab Spring is a new variable that cannot be easily controlled. What will happen in Libya and the rest of the Arab world vis-à-vis its relations with the US depends on how well the West in general manages its support for the peoples of the region. The era of dealing with clandestine groups and authoritarian regimes has been superseded by the need for transparency and open government created by new technologies. The West must anticipate the demands of empowered peoples in the Arab world, represented by governments that actually respect the dignity of all citizens. Photo Credit: TRIPOLI, LIBYA - SEPTEMBER 01: Abd al-Hakim Belhaj, commander of the Tripoli Military Council, looks on during an interview on September 1, 2011 in Tripoli, Libya. 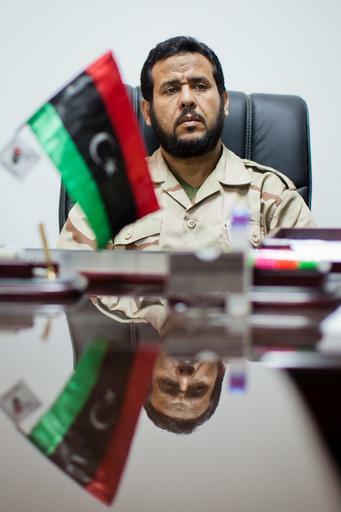 Belhaj led a group of rebels during the fall of Tripoli and wresting of power from Muammar Gaddafi. (Photo by Daniel Berehulak/Getty Images.